I've decided to start a thread where I hope that BMR fans can share their experiences with building the various BMR freight cars that are currently available. 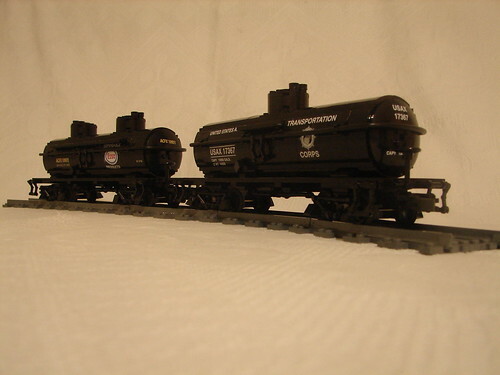 I have just completed my 9th car which is a 10,000 gallon, two-dome AC&F type 27 tank car. This is from the third set of instructions that the BMR gang has released. Here are some building notes, comments and tips that I thought may be useful to other builders. 1. Overall, the instructions are a superb. The wealth of information that they contain really shows the dedication, skill and knowledge of the BMR team. I love the histories that begin each instruction book. The blueprint pages are very helpful in some situations. 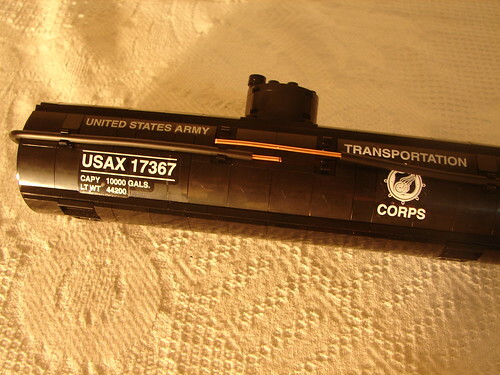 This set of instructions will build 6 different variations of the AC&F type 27 tank car. This leads to a parts list that will take some careful reviewing to insure that you are ordering the correct parts for the variation that you choose to build. BMR did a great job of making this as clear as possible but you will need to pay attention! To create a manageable parts list, I re-created the variations I wanted on LDD and then turn that file into a Bricklink parts list. Before anybody asks, no I will not share my LDD files. That would deny BMR their compensation for the effort in producing these fine instructions. 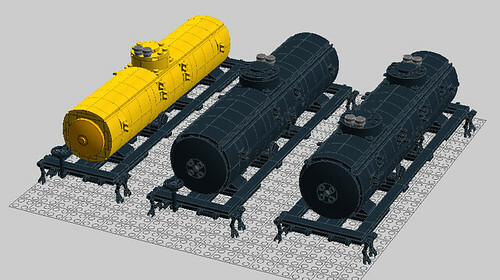 As a side note, I was able to get 95% of the parts for three tankers from one USA Bricklink dealer for about $160.00. This did not include parts for 6 sets of trucks which I had already built. I'd estimate I spent about $100.00 on this car including the decals but not the price for the instructions. 2. Ok, on to the actual build. The first part of the build is the black frame which is standard to all variations. Black is a tricky color to print and all is clear until you get to page 11 where you build and install the brake rigging. One thing that was a little confusing was that you build the rigging on page 10 and then for the install, you have to flip it upside down which is not readily clear or easy to do. I think it would be better to build the rigging the same way that it is installed so you're not having to do mental 180's. The bigger problem on page 11 is that it is virtually impossible to actually tell where sub-assembles 12 and 13 actually get installed. Number 12 is not too hard to figure out as there is an obvious spot for it but Number 13 is impossible from the graphic printed. A better picture of the area is on page 14 and page 5 (some what). After consulting these other photos, I determined that there is an error here. It looks to me that both sub-assemblies are installed on the same plane. The problem is that there is no obvious spot of #13 to go like there is for #12. If you attached #13 one plate-width off of #12, it will interfere with the rigging install. I solved the problem by removing the 2x2 corner plate (installed back on the very first step on page 6) to create a spot for the #13. I then filled in the rest of that area with two 1x1 plates. Here is a photo of that area to clear things up. 3 The frame is fragile. It fell apart many times during construction. I have considered making the two middle struts two studs wide so that they would catch the ends of the 1x8 tiles but have not done so yet. It would be an easy mod. You can see in this photo that the lower running boards get miss-aligned very easily. This fragility is not much of an issue once the model is complete but will lead to some choice words during the construction phase! 4. Building the tank. I substituted a 2x14 plate on page 15, step 1 and Page 20, step 5. Tank construction went smooth until I got to installing the side panels an page 45. When I tried to install these, the headlight bricks would "crush" inward and not affix smoothly to the 2x8 plates. I fixed this by re-doing the tanker core. I did not take a photo of the change and I will try to explain as clear as possible. Basically, what I did was install a 2x2 (2x4 for the center) plate on the back of all of the blue headlight bricks. So on page 16, step 6, change the black 2x2 plate to a 2x4 so that is catches the back of all eight blue head-light bricks eventually installed. You will have to re-order your building steps to accomplish this. On page 18, step 9, delete the yellow 1x2 and substitute a 2x2. Four more 2x2 plates will be needed to finish this mode. I hope this makes sense. There is a small goof on page 52, step 6. It shows that four 1x1 tiles are to be installed but it only shows the placement for 2 of them. Pages 53 and 54 show where these are to go under the running boards and behind the rails. 5. Apply the decals before installing the hand-rails, top running boards, or the tank to the frame. First off, I love the BMR decals! They are very easy to install compared to other decal methods. Those that have struggled with the old-fashion "water-slide" ones know what I'm talking about. Installing the decals on a curved surface required a little care to make sure they were straight. I built a simple cradle to hold the tank to prevent it from rolling at a critical moment with installing a decal. The "Esso" decal was the trickiest to get in the right spot. I trimmed the decal as close as possible on the right side so that it would fit a snugly next to the 1x1 clip holding the upper running board. Make sure that the bottom lettering ("Products") is lined up exactly along the bottom of the curved slope pieces. If you do, the spacing will work out nicely. You will be able to see the word "Dependable" between the running board and the hand rail. 6. Hand rails. I departed from BMR plan here and resorted to one of my favorite Lego tricks - copper wire! As you can see, I was able to achieve a nice smooth curve around the ends of the tanker with 3mm rigid hose and without those minifig hands. The first step is to find some 12 gauge copper wire with the insulation removed. This gauge of wire fits perfectly inside 3mm Rigid hose. 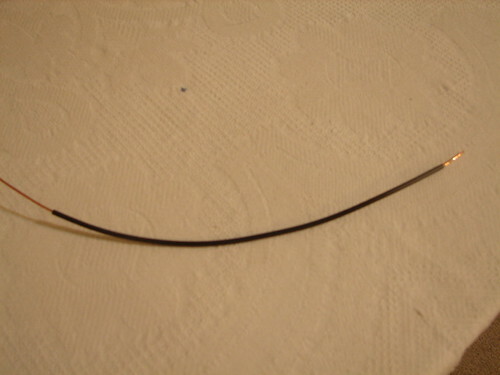 I used 2 pieces of part number 75c36 (rigid hose, 3mm, Black). It's a little rare but not expensive. You can use what ever lengths you want; just keep threading pieces on to your copper wire. You will need about 21 inches (70 studs) worth of tubing to encircle the tank. I cut the copper wire so that about an inch stuck out both sides. 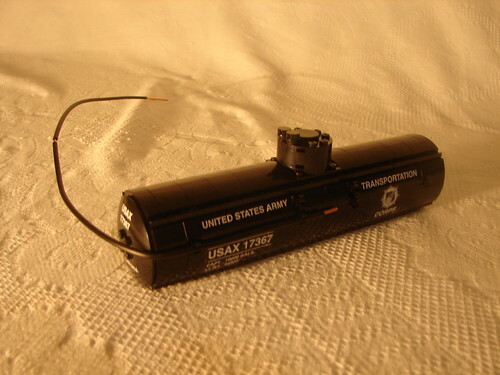 I then clipped one end on to the tank so that the copper wire is centered on the side of the tank. Bend the hose around the end of the tank using gentle pressure The 6x6 radar dish will form the curve. 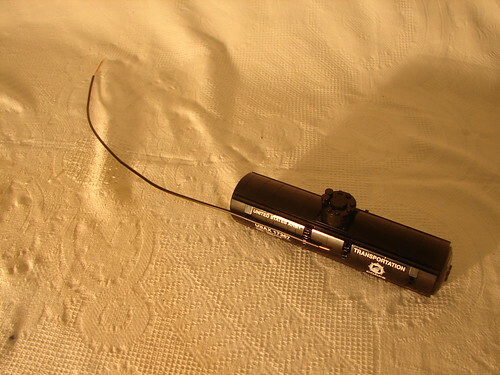 Keep bending the wire until you can clip it in on the opposite side of the tank. Use a pair of needle nose pliers to sharpen the corners. Repeat on the other end but start by sliding the 2nd piece of hose other the exposed copper wire from the first install. Bend this hose into place and sharpen the corners. Mine looked like this at this point. I then trimmed the copper wire so that the ends met and cut a short piece of hose that would fill in the gap over the copper wire ends. The end result looks like a seamless loop. That's about it. This was a very enjoyable car to build and I look forward to the next model which will be a flatcar with a load. Cant wait to see what "load" the guys will come up with. If you have any questions, please ask. I will back-tracking and will give an account of both the boxcar and the hopper. Look for those over the next week along with several boxcar variations that I have built. Hey what a great wagon ...stickers are the icing on the cake! Great tanker ecmo47! You also did a great job on those details. @ecmo47, great review on the instructions! I just got mine and looked through them and noticed some of the issues you bring to light. Thank you for clarifying those points! That will really help when I start building this! I completed my 10th car and second tanker today. It's the 10K single dome car. I had to swipe a pair of 6x6 radar dishes from my friend's son's Ninjago Mech dragon to make it happen. No tight-fitting decals on this model. Application was straight-forward. Once I got it bent around both ends and back to the start, I had an extra inch of copper that I needed to clip off. I also needed about an inch and a 1/2 more hose. 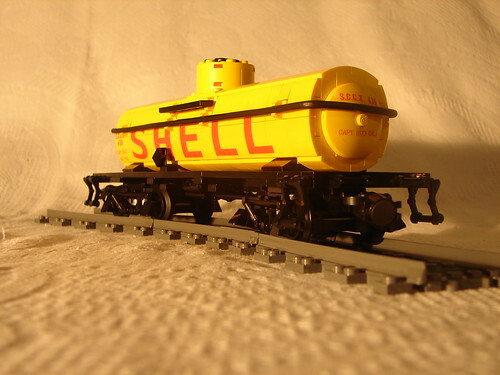 I've got the yellow 8K Shell tanker to go. The 4x4 yellow radar dishes are a little scarce and I'm getting them in from Europe. I'm still debating whether to use yellow hose or black. The instructions are vague in that regard and the hand rail goes directly across the lettering. Here's a parting shot of my two completed tankers. Excellent review. Glad you like the decals, I print them for BMR. For a more forgiving application, you can float the decal on soapy water. They are completely waterproof; ink, adhesive, and vinyl. I also recommend cleaning the surface of the Lego with a lint free cloth and some alcohol. My Bricklink order arrived today, so I was able to complete my final tanker for now. It's the 8K gallon, single-dome version. BMR has decals for Shell so it was built in yellow which really attracts the eye much better then black. The 8K tank has the same core as the 10K but does not have the extra layer of plates to expand the tank from 5 wide to 7 wide. It is not quite as important to reinforce the blue headlight bricks like I described above but it helps. One thing to be aware of is that the 4x4 dish does not cover up as many of the end brick as the 6x6 dish does on the 10K model. When building the core, make sure to use all yellow piece on the ends. 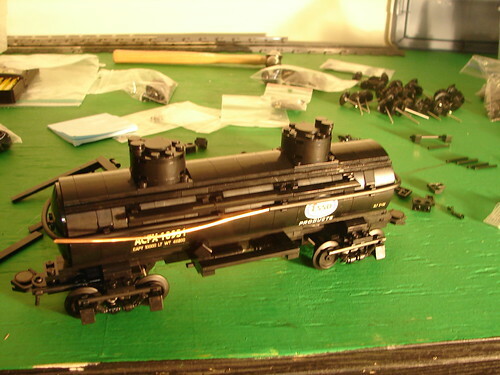 On this model, a steady hand and a level eye are extremely important for accurate decal installation. I started with the middle letter (the "E") and worked outward on both sides to help get the letter spacing correct. Pay attention to the card that comes with the decal so the various brick lines can be used to help align letters. 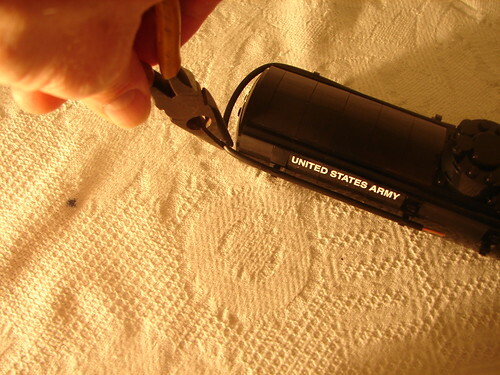 Trim the "H" and the "L" as close as possible so that they snug up to the 1x1 clip piece. Stop and take a picture when your tank says "Hell". I forget too! VERY IMPORTANT: Make sure that you do NOT install the "S" upside down. It is NOT symmetrical top to bottom. You can see that the handrail goes over the top of the letters a bit so make sure to get them as low as possible. The S.C.C.X sticker will need to be trimmed on both sides as close as possible so that it fits in it's designated spot. Also, make sure it is lined up with the bottom of the slope piece. If you don't, the top will be covered up by the hand rail. On the ends, make sure to place the smaller S.C.C.X high enough so that it is not covered by that darn hand rail. I left the middle ladders off as they cover the "E" too much for much for my liking. 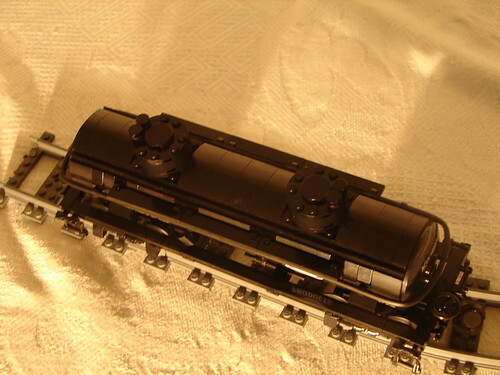 Next up will be a review of the first BMR Premium Instructions, the PS-1 Box car. 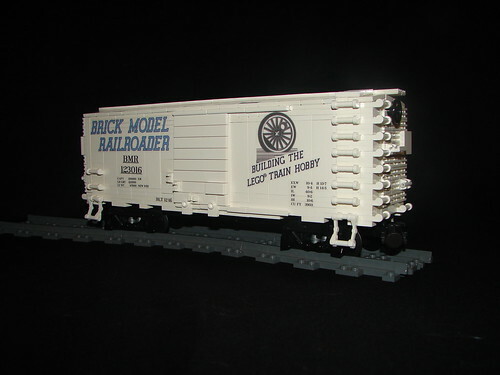 Im going to back-track now and go take a look at BMR’s first offering, the Pullman PS-1 40ft Box car. I looked at Youtube and reviewed some of the speed build videos and a “review” of the box contents but I haven’t seen any actual reviews of the instructions or building techniques so hopefully this will fill that void. The PS-1 Premium Instructions were release on 16 June at Brickworld, Chicago and on the new BMR on-line store. The first 20 copies sold out quickly as did a second run of 40 sets I believe. I think that they are on their third run of these instructions and they are currently available at the BMR store for $30.00. I was thrilled to get a hold of a copy of the initial run. The contents of the kit have been well documented but in case you missed it, you get a printed instruction book and a small bag of parts which contained the preassembled axles with bearings and three small Brickarms pieces for the brake rigging. I initial thought it was supposed to include a set of decals, but I was incorrect. The instructions are a good first effort but there are a few issues. These issues may have been corrected in the later printings but many of the flaws have certainly been corrected in the subsequent hopper and tank car instructions. The instructions start with a brief history of the Pullman box car along with some proto-type photos. One thing I’ll note here is that the cover photo is not the actual model built by the instructions so use it carefully as a refence. The next page has some helpful construction notes. Ignore the spelling errors, the editing process has improved! The following pages (6-43) are the step-by-step building instructions. They are very clear and lead to a very frustration-free build. The last 2 pages, 44-45, are the parts list which is the weakest part of the instruction. The picture and quantities are clear but it does not include part numbers. 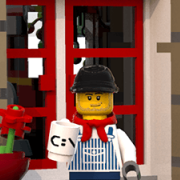 This is not a big issue for seasoned MOC’ers (the target audience) but could be a real point of frustrations for new builders not familiar with Bricklink. 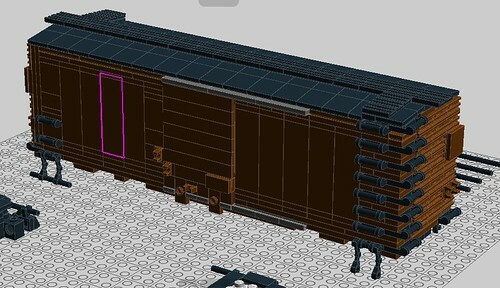 As I have done with all my BMR builds, I reconstructed the boxcar in Lego Digital Designer (LDD) and made a Bricklink Wanted List out of it. The 850(ish) parts for this model in white will run you about $220 if you shop carefully. I’m going to take a minute and talk about 3mm rigid tubing. After scratching your head in puzzlement at what lengths you will need, remember to refer back to the last paragraph on page 5 for what lengths are needed although that paragraph does not include the four 6-studs and two 4-stud pieces for the trucks. 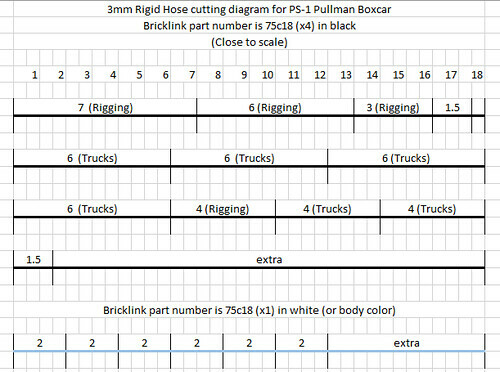 One note here is that BMR uses the word “flex” tubing but all Bricklink descriptions of this part use the word “rigid” so that is what I will use. I did some research on length vs cost vs availability and determined that four of part #75c18 (Hose, Rigid 3mm D. 18L / 14.4cm, black) is the best one to order. You will also need one #75c18 in white. I made the following cutting diagram to assist with cutting the lengths you will need. Also, I made this simple cutting jig to get my lengths right. Just move the 1x3 to whatever length you need. A sharp utility blade will give you a nice clean cut. If your having to “saw” at it, change the blade. Ok, on with the build. This car is basically a “studs up” construction with a SNOT technique for the doors and end panels. Here are a few tips/improvements that I did. Page 8, step 7 and page 9, step 8: Can use three 6x10 plates here. Page 13, step 16 (and other spots): I found that some of my ends panels could come off easily so I went back and added more studs to hold them on. Per the below photo, I increased the holding studs from 4 to 9. Green denotes change from the original instructions. Page 15/16, step 20: I added a third bracket (part #2436, Bracket 1 x 2 - 1 x 4) to hang the doors on, I did this because the doors tended to “cave” inward with handling at the top as there is an unsupported space behind them. Page 29, step1. Per page 5, the 1x1 tile needs to be taped on as it will fall out very easily. I replaced the tile and stud jumper with a single 1x2 plate. Page 31/31. Install the hinge assembles for the roof and then install the tiles. You will never get the sub-assemble installed without wrecking it. Page 38. Don’t bother making the rigging sub-assemble. Install each part where is goes on the bottom of the box car. Page 39. Trucks. The trucks are what sets this build apart from other Lego train creations and makes it look like a real scale model. I used to be proud of my Santa Fe passenger train and now it just looks like a phony with its fake euro-style wheels. Back to the trucks. The BMR guys have changed the truck design when the hopper plans came out. I’m not sure why they did this. I had pre-assembled a bunch “boxcar” style trucks early on and have not needed to build any of the new style so I cannot compare them. The outward appearance is the same, but the internal construction is different. Since the axle/wheels/bearings come pre-assembled, you will not be able to install all the Technic pins listed on page 39. 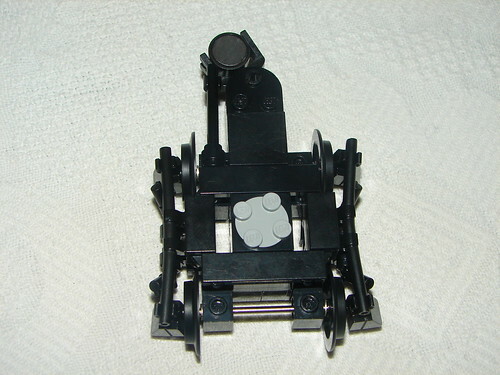 If you have un-assembled sets, you will notice that the axle does not fit very tightly in the Lego train wheel and will fall off quite easily. You will need to use a spot of super glue to keep them on. On page 40, I have not figured out how to get the rigid tubing over the minifig hand. I did not try very hard but it is not an easy process. The instructions have no hints or tips on how to accomplish this step. I added a 2x2 tile on top of the 6 exposed studs in front of the 1x4 tile. This locks the piece holding the magnet in place much better. 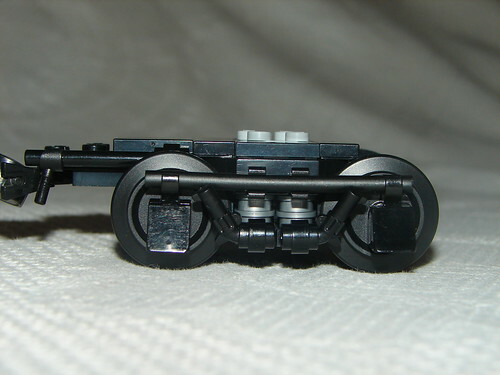 Once I got my first set of trucks completed, I did not like how fragile and temperamental the claw piece (#48729) was. It must work on dozens of BMR cars but mine kept spronging off. I achieved the same effect with a couple #4081b (Plate, Modified 1 x 1 with Clip Light - Thick Ring) and part #30132 (Minifig, Weapon Gun, Pistol Revolver - Large Barrel). My last note about the trucks is that I found that the clip from the 1x1 plate holding the cheese slope often rubbed up against the wheel sets causing friction. I gave the rigid tubing a slight, banana shaped curve to hold the bearing boxes away from the wheels. I also used flat silver for the 1x1 round plates so that they would look like springs. Here is a photo of the completed PS-1 in white with the BMR stickers on it. I've wondered why they choose white as there are not too many actually prototypes in this color but I'd guess that it is because it was the color of their signature "billboard" car. They are considering releasing some additional decals sets for the PS-1 but nothing is firm yet. Since I've received the kit, I have built 6 boxcars and in 5 different color and created 11 different paint schemes in LDD. I will detail various color builds in later posts. I hope that this is informative and helpful to other BMR builders. Hope to see some others work posted here. I agree with you on the claw piece in the trucks and really like your solution. However, the cost of 8 pistols for one car vs. The cost of 8 claws is significant especially if you are building many cars. I was thinking about a drop of Elmers glue to help stabilize the claws. I've found that the newer revision of the claw likes to pop off. The older ones will stay on forever. I think this is the old one: https://www.bricklink.com/v2/catalog/catalogitem.page?P=48729b#T=C I may have them backwards though. My second and third BMR builds were Reddish-Brown PS-1's which are probably the most common color for a boxcar. 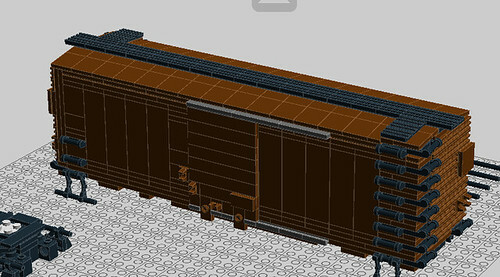 As is my normal procedure, I built the box car in LDD to generate a parts list for Bricklink. All of the white parts can translate directly to Reddish-Brown except for the eight of part #30377 (Arm Mechanical, Battle Droid) used for the stirrups. The closest colors they come in is Dark Orange or Dark Brown which is the color I used. The rigid tubing does come in Reddish-Brown under parts #'s 75c14/16/18/26 and 28. As is noted in several places, both 1x2 modified plates (#2540 and #48336) are a bit rare, expensive and hard to find in the quantity needed (36x#48336). You might want to consider switching to black which looks pretty good. 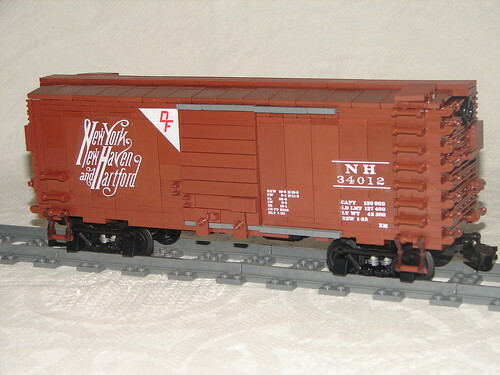 I lettered one of my boxcars with Walthers O-Scale decals. I picked the NYNH&H for the interesting scroll-work logo. I have not lettered my second Reddish-Brown box yet in hopes that BMR will put out a nice set of decals. The Walthers ones are nice but I'm concered that they will not last very long and will flake off. I ginned these up to show what substituting black would look like. Having black running boards and/or roof helps it look natural and there are some prototypes out there that are painted like this. 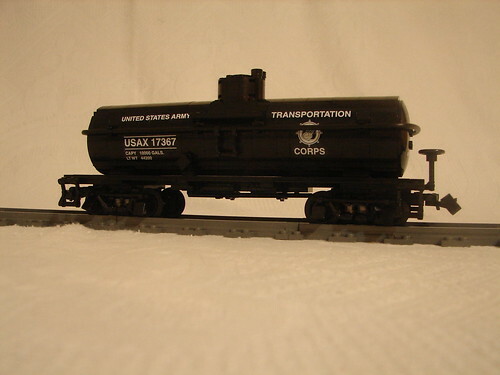 Here is the 4th boxcar in my collection: Medium-Blue. This one departs from the exact BMR plan in several areas due to part availability. 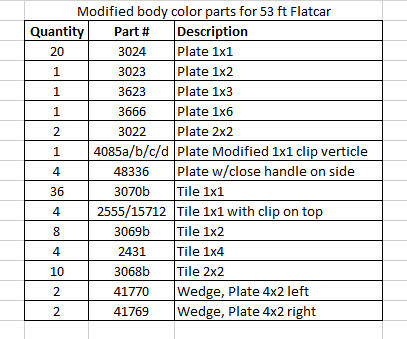 I'm not going to detail all of my modifications but here is a list of the parts that do not exist in Medium Blue (MB). 32028: Plate 1x2 with slide rail. This is the first car where I decided that, regardless of color, I was going to make all my door rails Dark Blue Gray. As noted above, the 1x2 plate with slide rail is not available in MB so that prompted the initial change. I found that DBG was a good color complement so used it for the various small detail parts. Initially the only MB car I could remember was the old "The Rock" design that appeared in the 1970's (I think). 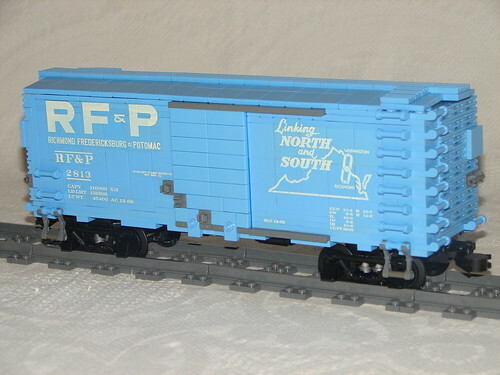 Later I was reminded of the RF&P boxcar (which is displayed in near-by Wilimington, NC) and was able to locate a set of decals for it. Once lettered, I was very happy with the results. It's a very eye-catching car. Here are my 5th and 6th boxcars. They are heavily modified from the PS-1 plan to account for part availability and the style I wanted to achieve. The 5th car is the Susie-Q car done in Dark Turquoise (DT). The inspiration for this car came from Cale Leiphart, who is one of the BMR team. He has a beautiful Pittsburgh and Lake Erie car that he displayed at Brickfair, VA. His build is significantly different as it uses a lot of 1x2 bricks to build the sides. I followed the basic design of the BMR plan and was able to use some DT 1x2x3 bricks and 2x8 Technic plates to good effect. The part pallet is pretty limited in DT and those that you do need are very hard to find in quantity. 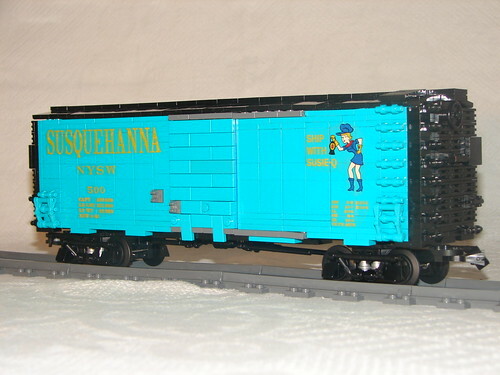 I originally built this as a 40 footer (32 studs long) but when I received the decals, the "Susquehanna" was too long to fit left of the door. I then re-built it 36 studs long which would give it a scale length of 45 feet. I briefly considered going a full 40 studs long which would equal 50 scale feet as the PS-1 did have a 50 foot version. This idea was abandoned after evaluating my very small pile of left over DT parts. I may, someday, give this model a DT roof as most of those parts (1x2 and 2x2 tiles, 1x2 grills) are available that color. 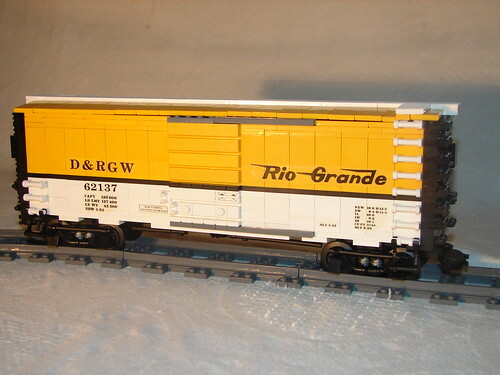 The 6th car is this Rio Grande model. Having spent by youth in Denver, Colorado, the D&RGW has always been my favorite road and this cool orange/silver/black paint scheme was just begging for representation in my fleet. Due to decal size it is also a 36 stud car. The biggest departure from the BMR plan is the "sliding" door on each side. I wanted a continuous black line running across the car and the BMR plan does not accommodate that. The support for the door is a bunch of 1x1 and 1x2 bricks with studs on the sides to hold the 1x6 tiles. I should note here that I filed down some studs from the DGB door rail so that the roof tiles would sit flat. You can see in this picture that I need to do a little more filing! There are couple more boxcars that I may build. One is the DRGW "Cookie Box". The prototype is silver which I would represent with Light Blue Grey since I already have a white boxcar. The other is a lovely green and yellow Rutland boxcar. That wraps up boxcars for now. Next up will probably be a review of the hopper car instructions unless I jump straight to the flat car with is supposed to be out soon. Well, I still have not got around to writing a review for the hoppers so it will be a jump straight to the 4th BMR Premium offering: the AAR 53 foot flatcar. As the guys discuss in the video, this kit is unique in that you get two sets of instructions of the price of one. The kit contains instructions for the flat car, a separate instruction book for the D-4 cat, 4 wheel sets to make 2 sets of trucks, and a packet of Brickmania tread links for one dozer. Along with the instructions, BMR is offering 8 sets of decals to cover 4 different body colors. I have not tackled the D-4 yet so this post will just cover the flat car. The instructions continue to improve with each and every release. This one has more pictures, more diagrams, and building tip photos. 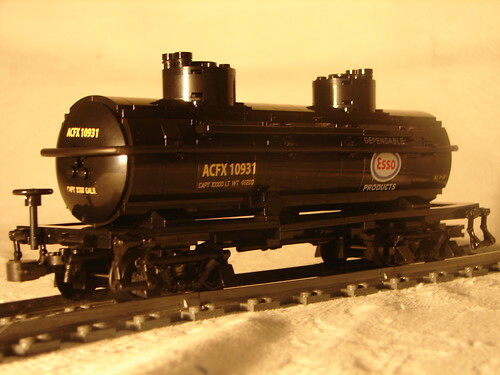 The instructions follow the same format established with the PS-1 boxcar: Contents page, introduction letter, history with photos and diagrams, blueprint of the completed model, building steps, notes on color and parts substitutions, and a parts list. It is a very well polished product. 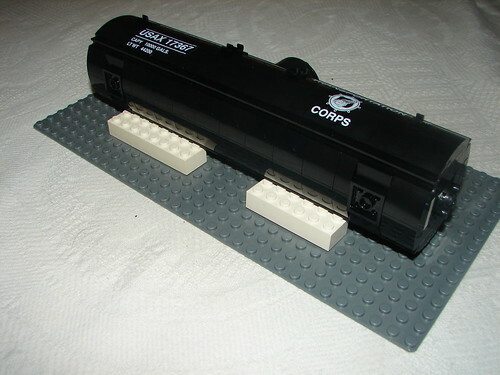 Of the 4 BMR offering, the 53 foot flat car has the lowest parts count (409) and is the simplest build. Of that part count, 25% (108 pieces) are used for the trucks alone. The basic frame is standard "studs-up" construction and the side panels are "studs-on-the-side" sub-assemblies held in place by eight part #2436 1x2-1x4 brackets. 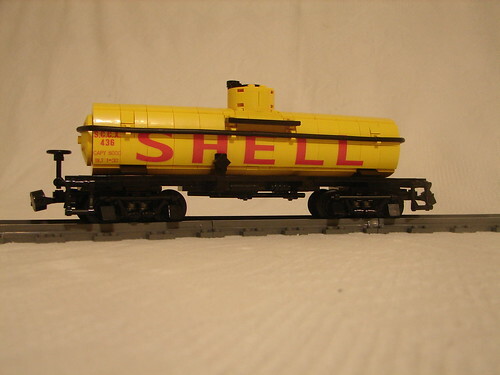 I had several pre-built sets of trucks and so I only had to find the 300ish pieces for each the flatcar body. 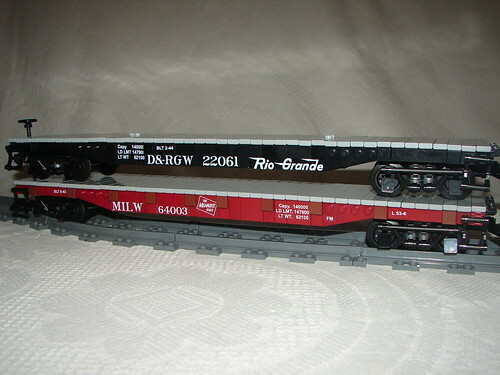 I was able to round up enough parts to build two cars: one in black and lettered for my favorite rail line, the D&RGW, and the other a modified Dark Red version lettered for the Milwaukee Road. There is not much to talk about in regards to the build. A bulk of the frame is built during the first two steps. The next 4 pages cover the side panels. This step was a little fussy as there are a lot of parts laid out that do not get tied together until later steps. After struggling through the first one, I built the successive ones from one end to the other which I found much easier. After installing the 2 side panels to the mere eight studs of connection points, the decking is installed which ties both parts together very well. The instructions note that you can use a wide variety of muted colors for the deck. I used Light Blue Grey as that was what I had on hand and like the contrast with the darker body color. The next couple pages cover finishing the spine and installing brake cylinders. I found a small error on page 16, step 9. I had to use two 1x1 round plates to attach the 1x1 brick with stud on the side (part #87087) to the underside of the decking. The instructions show only one on this spot. Maybe I just didn't install it right. The last step is constructing the trucks. 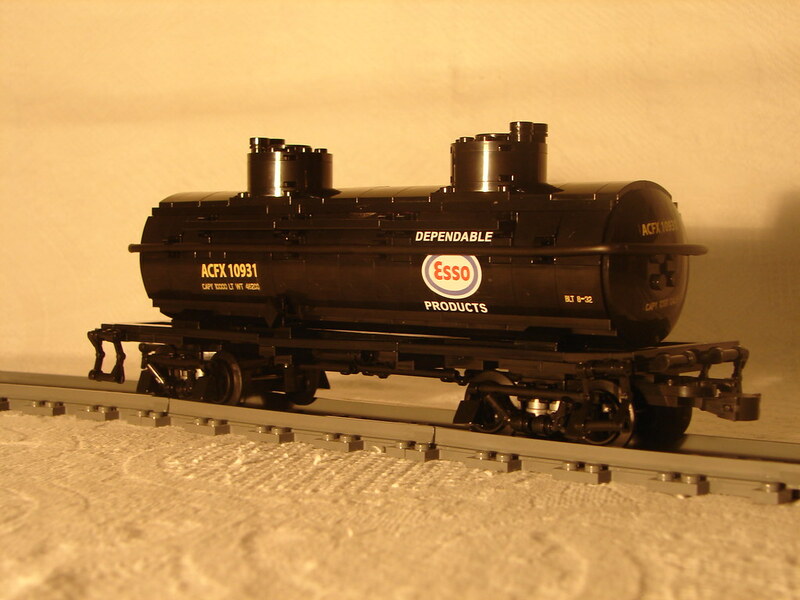 The trucks are the same as the last two models (hopper and tanker). I'm still using the truck design from the boxcar instructions. BMR has not explained the design change but I suspect that it has to do with the pre-made wheel sets that they provide. In the old design, you could not install some of the needed Technic pins without detaching one of the glued-on wheels from the axle. This is not a problem with the new design. Lastly, on page 18, they provide some photos an how to install those pesky 3mm tubes to the mini-fig hands used to simulate the brake lines. I had not cracked the code on how to do this so was glad to see this building technique. 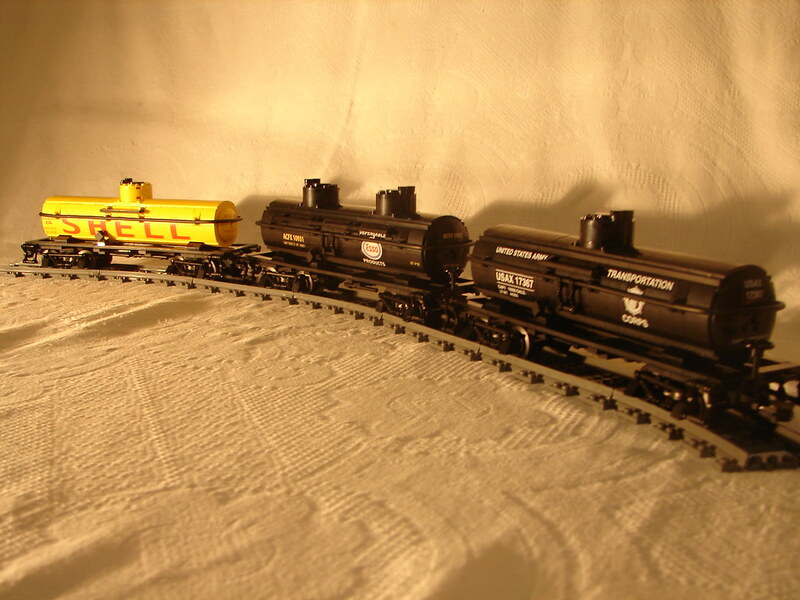 Per the photo's, I used BMR's D&RGW and Milwaukee road decals. They are of the same excellent quality and a joy to install. There is no room for error though and the lettering is exactly one tile width wide. You will have to trim all decals right to the top of the lettering to get them to install correctly. One tip is to remove all of the 1x2 tiles that represent the stake pockets so you have the "under tile" area to maneuver your decal around in. The decals do fit in their designated areas (with careful trimming) but they seem like they are one font size too big. There is NO room for placement error. One change I would like to see is for a darker back ground on the white lettering decals. It sure would make the necessary trimming much easier. This is a relatively quick build and it will a lot of fun to see what additional flatcar loads that others come up with. 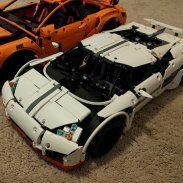 BMR hinted that they may come out with another build of their own which would be welcome as always. In the mean time, I need to see if I can capture the pertinent details of the Allis Chalmers WD that my dad and grandfather used to farm with. For the dozer build is it possible to swap for tan or olive green to do a military version? Thanks again for the review Scott. I'm glad you like the improvements we've been making to the instructions. Making these is not easy work, unfortunately we don't have millions of dollars to budget, and a team of graphic artists like LEGO, so we make do as best we can. But we are committed at Brick Model Railroader to doing our absolute best and we take every ones comments to heart on how we can do better. To answer some specific comments/questions. I was very conscious of the build for the flat car. It is indeed the less complex, lowest piece count of all the cars done so far. There just really isn't a lot to work with on these types of cars. I was very worried that it would be seen as a one trick pony, hence the inclusion of the Cat D4 model. Flat cars always look more interesting with the load any way. The side panel instructions are indeed a little finicky, but hopefully met builders will find a way to manage. Making these instructions is always a balancing act between making things as clear, and simple as possible, and managing page count. This may be a case where more break down into subassemblies is required. I'll have to take a look at page 16 to see what might be going on. I don't think it's an error, but maybe just a bad illustration of the final assembly going into place. The change in the truck design was made after the boxcar to eliminate a bad design with the pins, and make the truck more stable. The bearings don't like to be missaligned, this can cause them bind or even to fail prematurely. 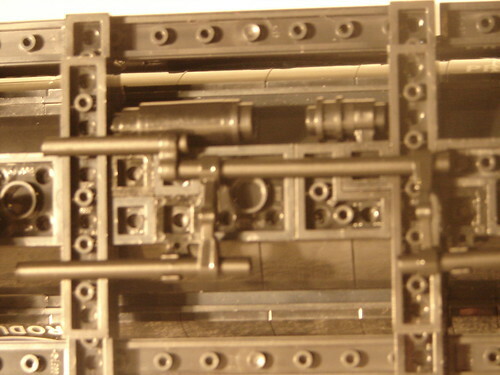 The new design locks the Technic bricks holding the bearings in place, preventing misalignment. It also eliminates the use of an older out of production part. 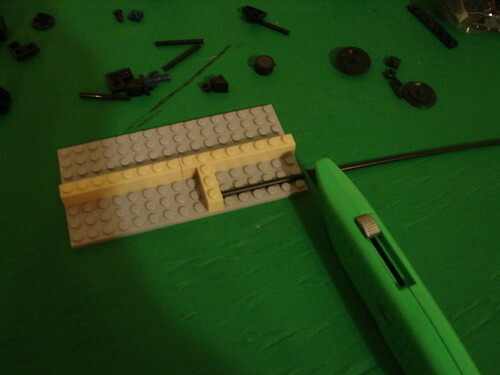 Hopefully the 3mm tubing/mini fig hand assembly notes make this step easier for builders. I've found that most flat cars simply get a single color paint job over the entire car, underside and all. Sometimes even the trucks got body color. I'm not certain why this was the case other than it was just easier to not change colors when painting the under frame. Box cars though seemed to be the opposite with their under sides painted black typically. Butter a few months out on the road, I would expect most flat cars undersides to be coated black with grime so either way could be plausible. Some of the decals are a little on the tight side. Maybe a little more than expected. I'm not sure if that was an error on my end with the graphics, or in translation to the printer. They do all fit though, but some as you say take a little more care to get right. I'm not sure what can be done about a contrasting backing though. I'll have to talk with Andy and see if he can find some clear vinyl stock with a darker backing. Thanks for the information and insight. Frankly, I don't know how you guys accomplish all that you do (and in the time that you do it) with the website, train shows, Premium kits, decal design etc, etc. You guys are certainly multi-talented! I need to go back and tweek my trucks. Many of them do not roll as freely as I think that they should and it may be the binding that you described. I'm going to rebuild a few to the new design and see if they operate better. Any ideas on what to do since part 48336 in reddish brown has become incredibly rare? Using black just doesn't look as good. Could dark red be substituted? They're becoming very rare as well. Build it all in white and say it's covered in snow. Are there going be any restocks of the boxcar instructions in the near future?